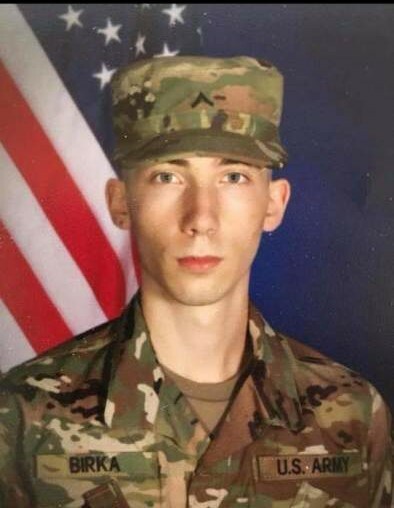 Keaghen Matthew Birka, 19, of Aurora, CO, passed away unexpectedly doing what he loved on April 3, 2019 in a motorcycle accident, while serving as an Army Specialist at Fort Stewart Army Base in Georgia. Loving son of Kevin and Angela Birka of Aurora, CO. Proud brother of Corinna Birka (Jake Carroll) of Shelbyville, KY, McKenna Birka of Aurora, CO and Gillianna Breslar of Aurora, CO. Special grandson of Bruce and Lisabeth Kinney of Parker, CO, Peggy and John Sawyer of Elizabeth, CO and Rane Birka of Bullhead City, AZ. Cool uncle of Grayson Carroll. Radical nephew of Steve (Shelly) Sawyer of Parker, CO, Jessica Kinney (Tim Lewis) of Parker, CO, Sara Kinney and Ed Nohava of St, Paul, MN, David Birka of Newport, WA, Larry (Sara) Birka of Tehachapi, CA, Tiffany Birka of Bullhead City, AZ, Junior Birka of Bullhead City, AZ, Cousin of Jakob, Christian, Devon, Brandon, Laura, Abram, Jude, Colton, Layne, Reagan, Jade, Ryan and the late Canyon Kelly. Celebration of Life at 4:00 p.m. on Monday, April 15, 2019 at Parker Evangelical Presbyterian Church, 9030 Miller Road in Parker, CO. Burial at Fort Logan National Cemetery, Staging Area "C", 3698 S. Sheridan Blvd., Denver, CO at 10:15 a.m. on Tuesday, April 16, 2019 with full military honors provided by the United States Army. In lieu of flowers, the family suggests bring a toy or stuffed animal (new, in package) to the Celebration of Life service to be donated in Keaghen's memory to the Children's Hospital.